eGlass will provide a contemporary edge to any guestroom. 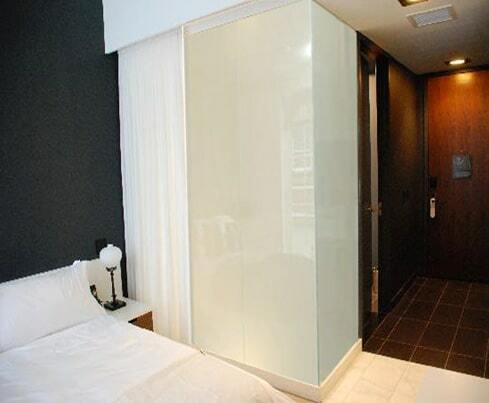 In this installation, electronically switchable LC Privacy Glass was used as a room divider between the bedroom and bathroom. LC Privacy Glass offers your guests the perfect balance of space where openness & privacy can co-exist. Incorporating LC Privacy Glass as a wall of the shower is a high-tech design that most people have never heard of, but giving them the ability to control the state of the glass is something that people will have to see to believe. Usually hotel guests will flip the switch back a forth a few times just for the novelty – they love to see the glass fog up. With the touch of a button, LC Privacy Glass allows you to decide when the glass is clear; with full view from room to room, or transparent; when you want to maintain a higher level of privacy between the two rooms. Even in the private state, diffused light is still able to pass, allowing for a bright bathroom. Opting for a glass wall as a divider will make the room appear larger, brighter & more inviting.